You are here: Home / design / Where do comics/cartoons fit? I’ve regularly suggested that you want to use the right media for the task, and there are specific cognitive properties of media that help determine the answer. 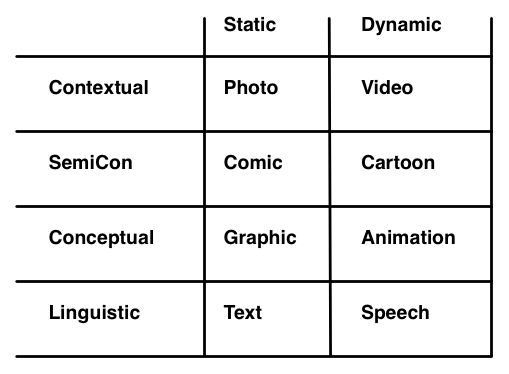 One important dimension is context versus concept, and another is dynamic versus static. But I realized I needed to extend it. To start with, concepts are relationships, such as diagrams (as this one is!). Whereas context is the actual setting. For one, you want to abstract away, for the other you want to be concrete. 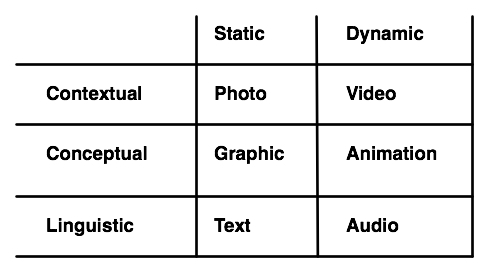 Similarly, some relationships, and settings, are static, whereas others are dynamic. Obviously, here we’re talking static relationships, but if we wanted to illustrate some chemical process, we might need an animation. Audio’s a funny case, in that it can be static as text or dynamic as audio. The needs change depending on where you need your attention represented: you can’t (and shouldn’t) put static text on a dynamic visual, and you can’t use video if the attention can’t be visually distracted. Audio is valuable when you can’t take your eyes away (e.g. the audio guidance on a GPS, “now turn left”). Note that there are halfway points. You can capture a sequence of static images in lieu of a video (think narrated slide show). Similarly, a diagram could be shown in multiple states. And this is all ignoring interactives. But there’s a particular place I want to go, hinted above. I was reflecting that comics (static) and cartoons (dynamic) are instances that don’t naturally fall out of my characterization, and realized I needed a way to consider them. I posit that comics/cartoons are halfway between context and concept. They strip away unnecessary context, so that it’s easier to see what’s important, and have the potential (via, say, thought balloons) to annotate the world with the concept. So they’re semi-conceptual, and semi-contextual. I’ve regularly argued that we don’t use them often enough for a number of reasons, and it’s important to think where they fit. This is my proposal: that they help focus attention on important elements without unnecessary details and the ability to elaborate (as well as the rest of the benefits: familiarity, bandwidth, etc). So, what do you say? Does this fit and make sense? Are you going to use more comics/graphic novels/cartoons?